When patients need specialized medical attention for their veins, they can rely on getting the highest-quality care from the husband and wife team of Gary E. Lane, MD, FACS, and Renee Lane, MS, RN, ANP, at Pueblo Vein Center in Pueblo, Colorado. They focus on each patient, determined to give everyone they see the attention and customized treatment they need to ensure optimal health. At the office, the team is proud of the technology they use, from their top-of-the-line diagnostic ultrasound using the GE Logiq 8S, to their proven AngioDynamics VenaCure EVLT® system for eliminating varicose veins. They place such a high value on providing the best care that they upgraded their VenaCure to include the NeverTouch® gold-tip laser, which prevents the laser from touching the sides of the vein. In addition to diagnosing and treating the full scope of vein problems, the team at Pueblo Vein Center offers vascular screening at their IAC accredited lab, an accreditation they receive because their ultrasounds consistently produce excellent quality and accuracy. When patients need surgery, they can count on Dr. Lane’s vast experience as he has performed minimally invasive vein treatments longer than anyone in Pueblo or Colorado Springs. Patients can also receive top-of-the-line cosmetic care at Pueblo Vein Center. They use the outstanding Cutera Xeo® laser system to treat spider veins and provide skin rejuvenation that smooths away age spots and wrinkles. 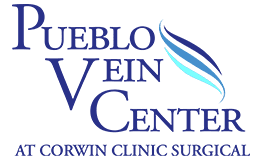 When patients need specialized treatment for their veins, from the most complex problems like deep vein thrombosis to the removal of varicose veins, they can count on the team at Pueblo Vein Center to take the time to understand their concerns and honor their priorities. To schedule an appointment, call the office or use the online booking feature. Receive $25 Off a Cosmetic Vein Treatment when you contact us through our webpage!